Ambassador to Israel David Friedman praises Trump for recognizing Jerusalem as Israel's capital. 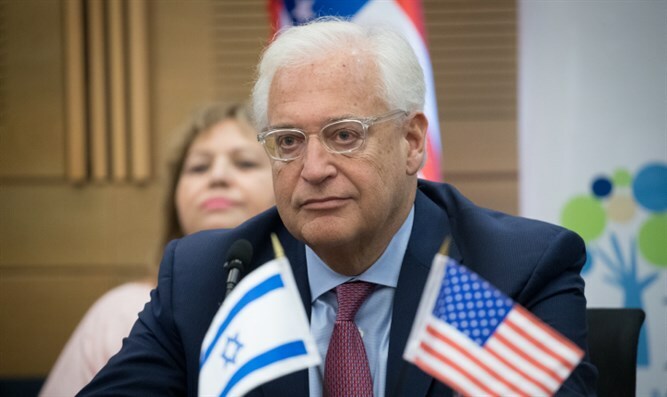 US Ambassador to Israel David Friedman thinks that President Trump's decision to recognize Jerusalem as the capital of Israel heightens the chances of peace between Israel and the Palestinian Authority. “The president didn’t want the Israelis to show up at the bargaining table and be forced to negotiate for something they already had,” Friedman told Fox News. Friedman reiterated that Trump's announcement on Wednesday was the result of a broad consensus amongst Americans that Jerusalem is the capital of Israel. "I think it reflects the popular will. After all, I think only six months ago, the Senate recognized, yet again, the centrality of Jerusalem to the state of Israel by a vote of 90-0," said Friedman. "I also think it’s the best path for peace". Friedman reportedly was one of the few officials in the Trump administration to support recognizing Jerusalem as Israel's capital. According to CNN, the move was vehemently opposed by US Secretary of State Rex Tillerson, Defense Secretary James Mattis and CIA Director Mike Pompeo. The report said that only Special Representative for International Negotiations Jason Greenblatt and adviser Jared Kushner supported recognizing Jerusalem as Israel's capital but lobbied the president to delay moving the embassy. On Wednesday US Ambassador to the UN Nikki Haley said that the move was for the American people and that Trump was not seeking any concessions from Israel in return.